Having a child who does not feed or eat well can be troublesome, frustrating, confusing, and at times, medically concerning. At Child Success Center (CSC), we understand how challenging it can be to live with a child who has difficulty with feeding or eating. Our Occupational Therapists and Speech Therapists are trained in the Sequential Oral Sensory (SOS) Approach to Feeding Therapy. 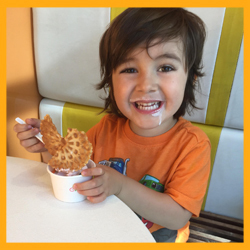 This approach focuses on teaching the child to eat a wider variety of foods and food textures, and guiding parents in the protocols needed to support their child’s optimal growth and development. As a parent, it can be difficult to know when to seek help for your “picky eater.” Common statements parents often hear regarding their child’s eating/feeding is, “all kids are picky,” and “all kids outgrow their pickiness.” However, this is rarely the case. Research has proven that about 20% of children will struggle with a feeding challenge at some point between birth and 5-7 years of age – only about half of these children completely “outgrow” their feeding challenges. 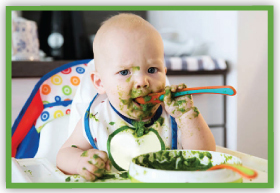 If you think your baby, child, or adolescent may need a feeding assessment, please contact us by calling 310.899.9597 or emailing officemanager@childsuccesscenter.com for further information. If you are unsure if your infant, child, or adolescent needs a feeding assessment at the Child Success Center, download and complete one or both of the following checklists. If you circle 3 or more Problem Feeder challenges or Red Flags on these checklists, your child may benefit from a professional assessment of their feeding/eating issues. Figuring out why a child isn’t eating or growing well can be complicated. Eating is the most complex physical task that humans engage in and the only human task that requires every organ system and all 8 of our sensory systems to coordinate simultaneously. 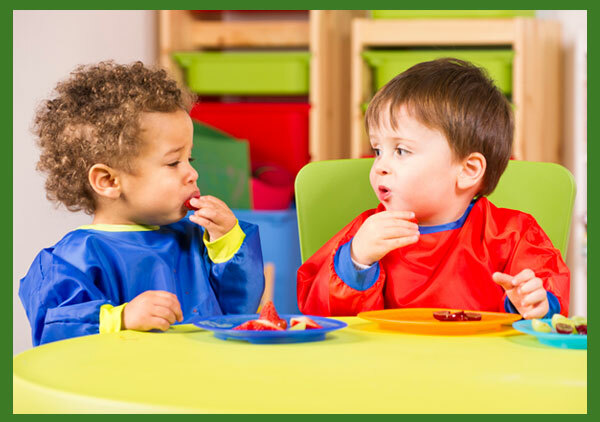 At Child Success Center, we follow the SOS (Sequential-Oral-Sensory) Approach to feeding. This approach, developed by Kay Toomey, PhD, is a trans-disciplinary, family-centered approach, which encourages children to explore new foods through a specific playful and non-stressful way. We begin with an assessment that looks at the whole child (organ systems, muscles, sensory processing, oral motor skills, social emotional skills, cognition, nutrition, and environment). The SOS Approach to Feeding is a play-based program that teaches children to eat at a pace that respects their readiness to progress through learning the 32 different steps involved in the task of eating in a non-stressful way. These steps range from tolerating the food in the room, to touching and kissing the food, and eventually to tasting and eating the foods. This approach focuses on increasing a child’s comfort level with food. 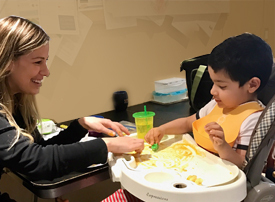 During feeding therapy sessions, children will learn the skills needed to eat a wider variety of foods and textures using the natural and social reinforcement of playing with their food and interacting with adults. Call Child Success Center at 310.899.9597 and asking for a Feeding Intake. One of our staff members will schedule your intake phone call with one of the Feeding Team members. During the intake call, you and the Feeding Team member will discuss the best treatment options for your child and your family. You will be sent intake forms and feeding history forms to complete prior to your child’s assessment day. The EVALUATION: consists of two one-hour assessments with 2 members of the evaluation team. The evaluation includes: face-to-face feeding and gym time, evaluation write up, treatment plan, and a discussion with parents outlining the major findings and next steps. During group feeding sessions, or “Food School,” 3-4 children will have a “Therapy Meal” together. Each week your therapist will send you a “menu” of foods in which your child and you will shop for and prepare together. Your child’s plates, cups, utensils, etc. will be provided based on the groups eating goals. Group therapy helps children learn about the foods through social modeling, or watching and imitating other children, which is the primary way children learn in typical development. Parent participation throughout the program is key, as parents are taught how to best support their child’s feeding growth. Group therapy sessions are facilitated by Occupational Therapists and Speech Therapists trained in this program. The SOS Approach to Feeding requires consistent participation of both the child and the caregivers. During individual feeding sessions, your child, therapist, and you will have a “Therapy Meal” together. Each week, your therapist will send you a “menu” of foods catered to help your child reach their eating goals. Other feeding equipment, such as plates, utensils, cups, etc. will be provided. Please call The Child Success Center with any questions – 310.899.4597.